You will receive 4 Fendi Mixed Childrens Items. A mixed joblot of girls items from the premium fashion label Fendi. 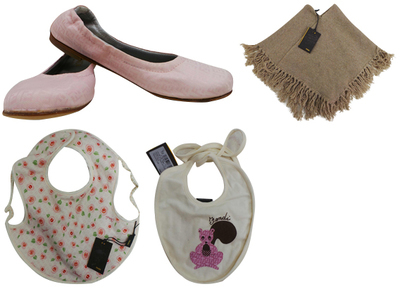 Bibs, a pair of flats and a poncho are included. Bibs come in 2 styles; one is decorated with colourful floral print and the other features a squirrel design. Flats come in a pink style that is decorated with logo print. Shoes are in size 10.5. A virgin wool blend taupe poncho with tassel fringes is also included. All are brand new and all but the flats have tags attached.